Mike Brown allegedly threw his hands up and yelled "I don't have a gun! Stop shooting!" but he was shot to death anyway by a yet-to-be-named police officer. Protesters following the event in Ferguson, Missouri are being watched by rooftop snipers. And there are numerous reports of police aiming automatic rifles at people filming the events, and opening fire with rubber bullets on unarmed crowds. This is what the disturbing trend of the militarization of America’s police force looks like. From Mike Brown in Ferguson to Eric Garner in New York, police forces are assaulting and killing innocent people, with no accountability. This is unacceptable. Police forces should be protecting us. By militarizing police across the country through the 1033 program, the Pentagon is encouraging local police forces to feel as if they are going into battle — with a clear enemy and a shoot-to-kill mentality. This national militarization of police must be stopped immediately. Sign the petition to demand that the Department of Defense dissolve the 1033 program and hold all police officers involved in brutality accountable. In light of recent events in Ferguson, Missouri and similar events across the country that indicate a militarization of our police forces, I am writing to demand that the 1033 program be shut down immediately. Police forces should be operating in the spirit of service, protection, morality and professionalism. Providing these forces with military-grade equipment has begun a dangerous and terrifying shift in mindset for police forces that they are operating in a war-like environment. 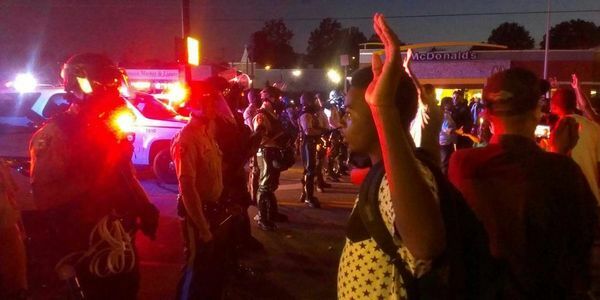 In Ferguson, police have fired rubber bullets at unarmed crowds and used tear gas against journalists. America is not a war zone, and the American people are not enemy combatants. We do not deserve to be treated as such. The Department of Defense needs to take responsibility for this police brutality and cut off this equipment at the source. Please do what is right for the people of America, and help restore our trust in our own police forces. Big news: President Obama is reforming how the federal government gives military equipment to local police! His order will direct agencies to "require a local civilian review of all federal equipment requests, mandate police receive the necessary training to use the equipment, require that police generate after-action reports when they use the equipment, and develop a database cataloging equipment sold." This is a big first step. Keep sharing this petition to help get the rest of the job done!